This image might be part of triptych or diptych. Produced in the mid to late 19th century, the period often referred to as the 'decadent' period of ukiyo-e; the subject matter reflects the feeling of unrest in Japan when the Shogunate Government was losing its grip on the rising powers of merchants & progressive regions. 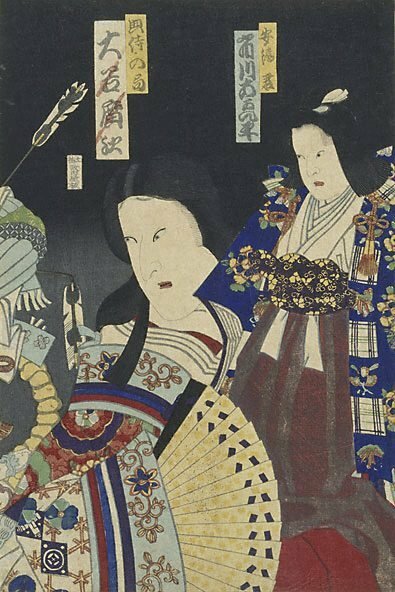 The subtlety of the pleasure seeking 'floating world' of earlier times gave way to depictions of emotional drama or violence taken from historical battles, stories of heroic deeds & the kabuki theatre. This period also produced intimate images of ordinary women in a manner which suggests an influence of Western paintings. Kunichika started publishing the actor series in 1869.